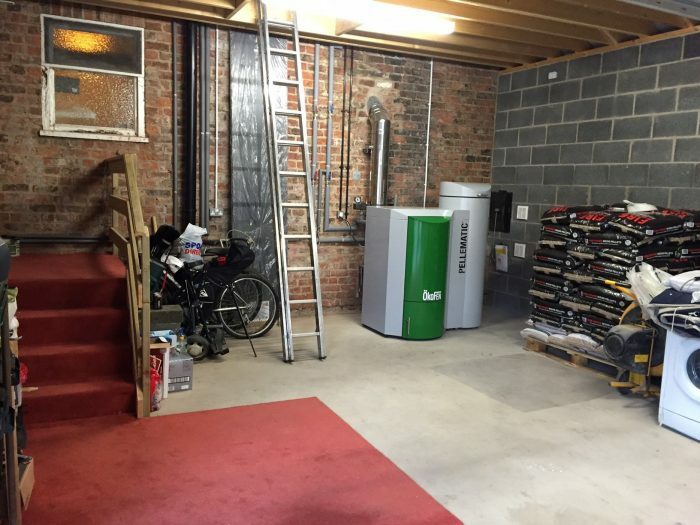 After completing a PV installation for this customer in August 2015, they also decided that they wanted to look into having a Biomass boiler installed, as at that point they didn’t have any heating in the property at all. The 322m2 detached property required a 25kW to cover the space heating and hot water demand of the occupants. At the same time as the install of the biomass boiler, we also replaced some radiators to make the system more efficient. We fitted a hand-fill boiler for this customer as oppose to an automatic silo fed option. They are managing to keep the pellets topped up manually but there is always an option to add an automatic pellet feed at a later date if required. Based on the Green Deal Assessment Report (required at the time) and the Energy Performance Certificate for this property, the customer receives a quarterly payment of £625 through the government run Renewable Heat Incentive.